Today’s First Two Pages essay concludes a three-part series featuring contributors to the anthology Malice Domestic: Mystery Most Geographical, which officially debuts at this year’s—this week’s!—Malice Domestic. Don’t miss the anthology launch, signing, and dessert reception on Malice’s opening evening, Friday, April 27, at 9 p.m.
Over the last couple of weeks, contributors Susan Breen and Peter W.J. Hayes have reflected on their stories in Mystery Most Geographical, and here G.M. Malliet not only discusses her story “Mad About You” but also explores the nature of travel itself and some of the dangers inherent in being out of your normal roles and routines. I’ve known Gin for a long time now and been a long-time admirer of both her novels and her short fiction—and of her just generally as a person. 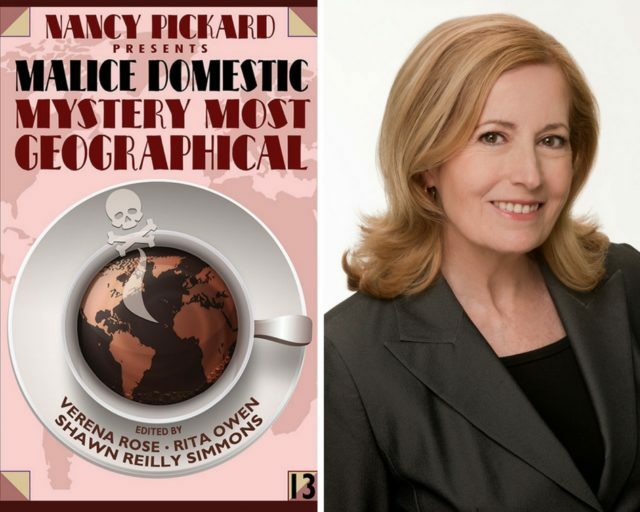 She won the Agatha Award for Best First Novel for Death of a Cozy Writer, the first in her St. Just mystery series. She’s also the author of the Max Tudor mysteries, the most recent of which, In Prior’s Wood, was released last week! You can find out more at gmmalliet.com. Please use the arrows and controls at the bottom of the embedded PDF to navigate through the essay. You can also download the essay here to read off-line. Thanks for joining us today! Such a fun essay, and looking forward to the story and the entire anthology as well!